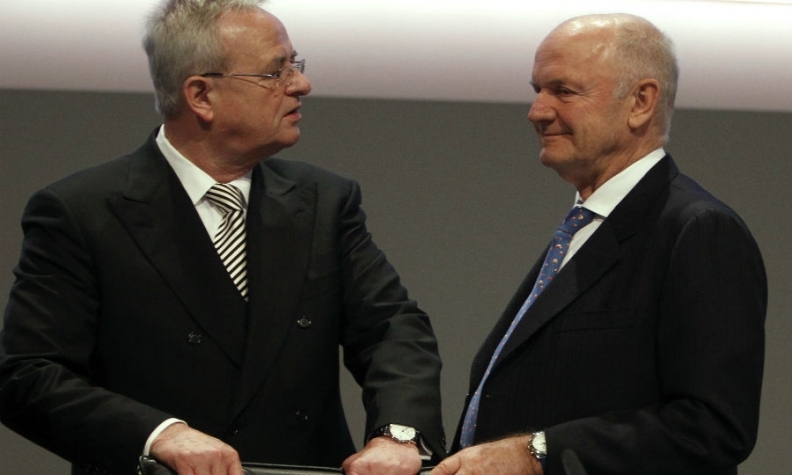 Piech, right, quit as VW chairman after failing to have Winterkorn, left, replaced as VW CEO by Porsche's boss. BERLIN (Bloomberg) -- All good dictatorships must come to an end and so it is with that of Ferdinand Piech, the 78-year-old patriarch who has ruled the Volkswagen Group since 1993, taking it from near-bankruptcy to challenging Toyota as the world's biggest producer of automobiles. Regrettably, however, the wrong side has lost in the battle to succeed Piech, which the German tabloid newspaper Bild called "the duel of Alpha males." In deciding who should now run the company, VW's board should have listened to its departing chairman one last time. Piech's spectacular turnaround of Volkswagen was in many ways Napoleonic. He was a tireless empire builder, buying companies at every chance he got and making expensive gestures that others found hard to understand. There was his purchase of the desirable, but hugely money-losing Bugatti; and the glass factory he built in Dresden to make the Phaeton, an upmarket VW sedan very few people wanted to buy. Despite such decisions, Piech has left the company with a 2014 net income of 10.9 billion euros ($14.4 billion), and global sales of 9.73 million vehicles, just behind Toyota's 9.98 million vehicles. And for many years Piech's word was law. He is a member of VW's founding family, which owns 51 percent of voting shares in the company. As chairman of the supervisory board, he put his wife, a former nanny, on the VW board. He also ousted the group's two previous CEOs with seemingly off-hand remarks. When Piech tried that with current CEO Martin Winterkorn, however, it turned out the board had grown tired of their leader's ways. When Piech said he had "distanced himself" from Winterkorn, employee representatives, the regional government and even part of his own family took the CEO's side. Piech could have backed off, but that isn't in his nature. The weekly Der Spiegel, which first reported the "distance" remark that set off the leadership battle, picked up indications that even after the board went against him, the patriarch had sounded out Porsche CEO Matthias Mueller about replacing Winterkorn. That was too much for the rest of the board, concerned that the leadership dispute was destabilizing the company, a giant with 600,000 employees. In German family-controlled companies, rocking the boat is the ultimate sin. Threatened with a forcible ouster, Piech and his wife chose to resign. This was about boardroom dynamics, family frictions (Piech's cousin Wolfgang Porsche was an early supporter of Winterkorn), government relations and leadership style aesthetics -- anything but the business of making and selling cars. As CEO, Winterkorn had undertaken a big push to grow VW's share of the U.S. market, doubling the marque's sales to 440,000 between 2009 and 2012. But then he appeared to lose focus just as the U.S. market heated up again. By 2014, sales were back to their 2011 level of about 367,000 cars, heading in the wrong direction to meet Winterkorn's target of 800,000 units a year by 2018. And because the U.S. is the world's second biggest car market by volume, after China, messing up there might be seen as enough of a reason for a change of chief executive. Mueller has been doing better in the U.S. He took over as chief executive at Porsche, which is part of the VW group, in 2010, the year after U.S. sales hit a post-2000 low of just 19,626 vehicles. In 2014, U.S. sales were up to 47,007 cars, an all-time record for the iconic sports car. There's another reason to think Mueller has been doing something right that Winterkorn hasn't. Porsche accounts for 7.8 percent of the group's revenue, but 21 percent of operating profit -- up from 8.2 percent in 2012. VW has 33.8 percent of the group's revenue and 19.5 percent of the operating profit, down from 31.7 percent in 2012. Analysts have scolded Volkswagen for its thin profit margins, and if the company wants to rectify the situation it needs more Mueller, not more Winterkorn. When a man like Piech has been running a company for more than 20 years, it's tempting to say enough is enough. Sometimes, however, age and superior knowledge of the business can be an advantage. Last year, when Leonardo Del Vecchio, the 79-year-old founder and chairman of Luxottica, the Italian global leader in eyewear, kicked out the company's 49-year-old CEO and took back a measure of operational control, many saw it as a retrograde step. Del Vecchio was ridiculed for saying of Google Glass, with which his company had made a partnership deal, that he would be embarrassed "going round with that on my face." Then Google gave up on its project, precisely because a lot of much younger people felt the same way about wearing the glasses as Del Vecchio. Estimated revenue at Luxottica was up 19.2 percent year-on-year for the first quarter of 2015, and net income is up more than 9 percent, suggesting Del Vecchio knew exactly what he was doing when he retook control of his company. Piech, too, appears to have known what was best for VW. The Financial Times likened the gap he leaves behind to the one that Apple had to fill after the death of Steve Jobs. As Winterkorn -- himself no youngster at 67 -- gets a contract extension, VW directors are destined to wonder for years whether they made the right decision, especially if the company's performance in the U.S., profit margins and competitiveness in new areas such as hybrid cars and assisted driving fail to improve. Leonid Bershidsky is a columnist for Bloomberg in Berlin.